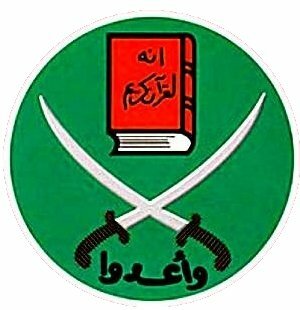 Logo of the Muslim Brotherhood, latest group that "threw itself into the fray". Old Frick has it easy today, as the story about White House officials meeting with members of the Muslim Brotherhood has two agencies, AFP and Foxnews, reporting on it. You’ll notice several differences between the two. White House officials met this week with envoys from the Muslim Brotherhood, in the latest sign that the Islamist group is returning to prominence in post-Mubarak Egypt after years in political exile. Subtle? Yes. But in this short a story, simple turns of phrase change the reader’s entire impression. It’s important to know that the Muslim Brotherhood has been ‘throwing’ itself into Egyptian politics since 1928 and has taken a shot at the top job before, successfully in 1948. The next headscratcher is the choice of quotes to show the administration’s position. The AFP utilizes a National Security Council spokesman quote, which bizarrely implies that a known agitator for Sharia Law is for… religious and women’s rights? AFP and Foxnews both drop the ball in their description of the Brotherhood’s presidential candidate, Khairat El-Shater. The AFP describes him as “a professor of engineering and business tycoon” while Fox runs with “prominent businessman.” Khairat El-Shater has been involved with the Muslim Brotherhood since the 1980s, was leader of their Greater Cairo branch, and most recently has been described as their “chief strategist and financier.” Kind of relevant, no? The United States, though, has not condemned the move. Administration officials have told The New York Times they were actually optimistic about the nomination — as he could pose a challenge to another hard-line Islamist candidate now leading the race. So now the White House isn’t just picking winners and losers in the US economy. It’s also picking winners and losers of internecine Islamist presidential politics in other countries. Given the White House’s poor success rate, the Muslim Brotherhood’s “chief strategist and financier” ought to denounce this endorsement immediately. This entry was posted in Daily Breakdown and tagged AFP, Egypt, Islamism, John McCain, Lindsey Graham, media bias, Muslim Brotherhood, New York Times, United States, White House by frick. Bookmark the permalink.